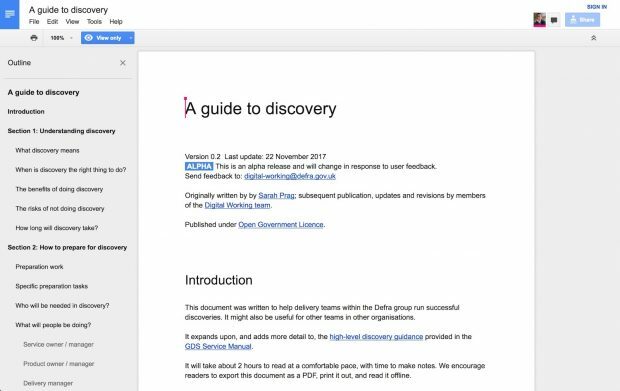 We've just published A guide to discovery (in alpha). We'd like you to tell us what you think of it. The guide was written by Sarah Prag and the Digital Working team. It's aimed at teams within Defra who are thinking about starting, or have just begun, a discovery. It builds on the page about discovery in the Service Manual. We wrote it because teams were asking for it. Sarah, a former member of the Digital Working team, was continually having the same conversations over and over again. People were constantly asking her for practical advice about discovery. It soon became clear that it would be better to write up what she knew and share that, rather than endlessly repeat it out loud. Although aimed at teams within Defra, we've made it public because we believe in making things open, because it makes them better. We hope it will be useful to teams in other departments who find themselves asking the same questions. We know that some of those teams have been, or are, writing similar guidance of their own, so we’d like to collaborate if we can. Either way, we think there will be people across government (and beyond) who can contribute useful feedback and suggestions for making it better. We spent a long time thinking about how to publish it. We considered GitHub, but we don't have the right skills in our team to publish and maintain content well using git. We thought about various other options too, but all of them had more potential pitfalls than benefits. Google Docs is easy for most government colleagues to view, and easy for our team to update. And anyway, this is an alpha. It will iterate, based on user feedback. If it turns out to be better for users to publish this guidance in another way, using another web service, we shall do that. looks really helpful. I look forward to the opportunity to reflect. Are there any plans to do a similar thing for Alpha? See what happens when you do a good job!